I found an easy and delicious recipe for roasted chicken that I want to share. Its quick enough to make on a weeknight but looks nice enough to serve on the weekend. We often reserve the best looking and tasting meals for the weekend don’t we? This recipe has got it all. I just love when things work out. It looks gorgeous on a platter – perfect for when you have guests over. I got this recipe from a new cookbook I bought by Gordon Ramsay called “Healthy Appetite”. Say what you will about Chef Ramsay but his recipes make for consistently great meals. They will not let you down. This book is uncomplicated and incorporates ingredients that you probably already buy regularly. No hard to find chutneys, apple butter or wood chips from the Amazon. 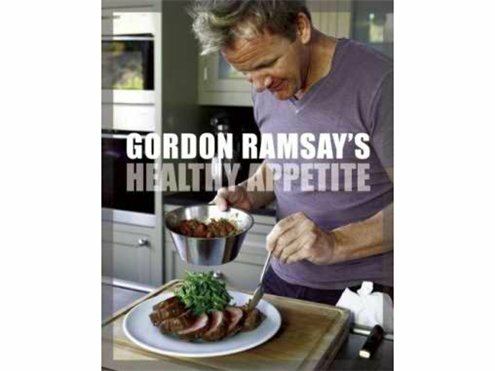 Gordon starts right off by saying that this is not a diet book. It is a cookbook that promotes healthy eating. I preach about this all the time. Eat good fats, vary your diet!! Don’t eat all the 0% fat stuff, the disguised cardboard snacks, they’re not good for you. Your body just stores it most of the time because it doesn’t know what to do with it. i.e. evil Margarine. Also, most diet foods are loaded with salt or chemicals which can be harmful to you in the long term. Back to the chicken. Maybe you’re thinking “I know how to roast a chicken” or “why would I do this when I could buy a roast chicken at the grocery store”? To that I say, this recipe could be different and its definitely worth doing it yourself. I’ve made it twice so far and it comes out juicy with a crispy skin. The entire dish has several dimensions of flavour which cannot be achieved with a store bought rotisserie chicken. 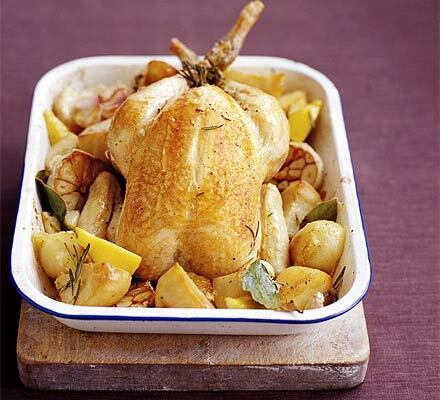 I love to bite into a a warm potato and taste a little lemon, rosemary and the juices from the chicken. And lastly, since the veggies cook with the chicken, its a one casserole meal. Less dish washing!! You can just make a simple salad to accompany it. Ok. Here we go with the recipe….no wait!…read my little notes first. Buy a meat thermometer please! It is a tool you will use time and again. You should always use one when cooking chicken and minced meat. You don’t need a fancy digital one and you can find one in most grocery stores. Weeknight: If making this during the week I have found it helpful if my carrots are scrubbed and potatoes rinced ahead of time & placed in the fridge. Then when I get home from work it gives me a little head start. Rub the chicken all over with salt and pepper, and a little drizzle of olive oil. Place in a large roasting pan and stuff the cavity with half the head of garlic, 2 or 3 lemon halves and a few herb sprigs. Roast the chicken for 20 minutes, then take it out of the oven and lower the setting to 400F. add the vegetables to the roasting pan and turn to baste in the juices. Put the remaining garlic, lemon halves and herbs around the chicken. Drizzle a little olive oil over the bird and vegetables and sprinkle with salt and pepper. Roast for 35-40 minutes* or until the bird is golden brown and cooked through. (minimum internal temp is 160 degrees for chicken) The juices should run clear when the thickest part of the thigh is pierced with a knife. *Note: I like my chicken cooked to an internal temperature of 180. I like it when the legs are practically falling off and the skin is super crisp. So I cook my chicken for longer than stated. I insert my thermometer in the thigh, making sure not to hit bone. I learned that it’s the legs and the thighs that take the longest to cook. Meanwhile skim off any fat from the cooking juices in the roasting pan, then place on the stove over medium heat. Add the wine scraping up the sediment from the bottom of the pan to deglaze and let bubble until reduced by half. Pour in the chicken stock and again , reduce by half. Strain and serve with the chicken. I have skipped the gravy because I didn’t have white wine suitable for cooking. The chicken was juicy and just fine without it. Made this recipe last night but with two Free Range chickens since we eat a lot and love to have leftovers. Amazing! The lemons give the meat and vegetables a wonderful flavour. I put small potatoes, baby carrots, half a turnip and herbs from my garden. It was absolutely delicious! I usually use a recipe that I have where you rub you chicken, between the skin and the meat, with a mixture of soft butter (lots of it!) and herbs. Also very goo but this one is definitely a keeper!